Holy Goblet (Holy Grail anyone?). You must put yourself to the test in order to save the world from its impending doom, it's up to you alone. This game wasn't bad, it can be fun. The only thing that kinda sucked was the graphics and sound. They were pretty much the same throughout the game. It gets boring after about twenty minutes of it. 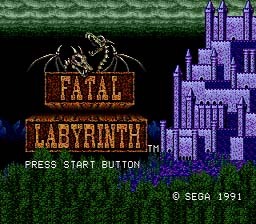 Other than that, this game is a lot of fun, so if you like RPG's give Fatal Labyrinth a try. Help Trykaar to find the Holy Goblet in order to save the world. There are a lot of items to find. You have to watch out for the staffs because you can't tell what they do until after you use them once. After you find out what they do, you will know for the rest of the game unless you die, in which case you will forget. It took me a while to figure this out, but you need to push your joypad in the direction of the enemy you want to hit in order to attack. Watch out for the black staff. If you find a black staff, don't use it. It will impair your vision.